I enjoy watching folks get creative with Gingerbread and was pleased to see a slew of Gingerbread cookies in the form of celebrities! You can find Gingerbread cookies depicting the domestic diva herself ~ Martha Stewart, actress Nicole Ritchie, and reality tv star Dog the Bounty Hunter. Visit here for details and instructions. 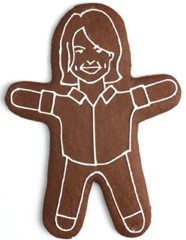 Posted in Edibles, recipe | Tags: Gingerbread, Gingerbread cookie, Martha Stewart Gingerbread, Nicole Ritchie gingerbread.